The International Gymnastics Federation (FIG) and Fujitsu Limited today announced their decision to practically implement a judging support system which they have been developing, with the aim of achieving real time judging support that is fair and accurate. The judging support system will now be tested at a forthcoming World Cup event and targeted for deployment at the 2019 World Championships held by FIG, a global organization that governs gymnastics disciplines, including artistic and rhythmic gymnastics. In addition, FIG and Fujitsu have signed a contract for a new partnership program to promote the deployment of the judging support system to be used by its Continental Unions and Member Federations for training and education purposes and for use at their competitions. FIG oversees national gymnastics organizations, while setting gymnastics rules and hosting international competitions. Fujitsu is a leading Japanese information and communication technology (ICT) company, offering a full range of technology products, solutions, and services to overcome challenges in the society. The two parties started collaboration in 2017, and have worked together with the aim of implementing a judging support system. The judging support system is planned to be deployed at the 49th Artistic Gymnastics World Championships in 2019, scheduled to be held in Stuttgart, Germany. Accordingly, it will support scoring for certain competitions, as FIG and Fujitsu aim to expand the application of the technology. Both parties will continue to develop the technology, aiming to automate judges' scores from 2020. 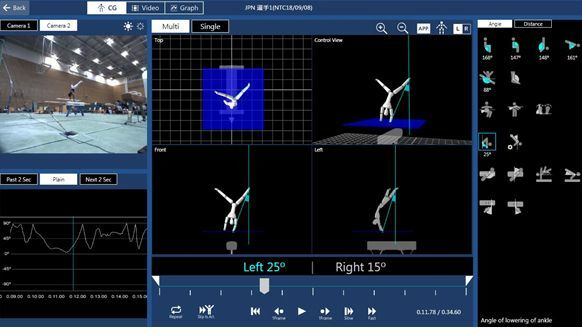 Supplementing the visual observations of judges, the system developed by Fujitsu and Fujitsu Laboratories will assist judges in coming to accurate determination of elements by capturing the gymnasts' movements with 3D laser sensors and analyzing as numerical data. FIG and Fujitsu have agreed to a new partnership program to promote the deployment of the judging support system at national gymnastics championships held in countries around the world. They will also work together to advance the use of ICT in gymnastics beyond judging support, for athlete training and for entertainment applications. Start use in 2019 at competitions held by FIG, promote system implementation in leading countries by 2024, and for 2028, promote expansion to as many as possible of FIG's 146 member countries. The International Gymnastics Federation is the governing body for Gymnastics worldwide. It is the oldest established international federation of an Olympic sport and has participated in the Olympic Games since their revival in 1896. The FIG governs eight sports: Gymnastics for All, Men's and Women's Artistic Gymnastics, Rhythmic Gymnastics, Trampoline - including Double Mini-trampoline and Tumbling -, Aerobics, Acrobatics, and Parkour. It counts 146 national member federations and has its headquarters in the Olympic Capital of Lausanne (SUI).